We are engaged in offering quality range of mini extinguisher, mini fire extinguishers, which is highly demanded by our clients, spread worldwide. 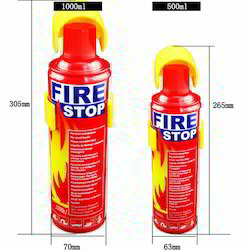 These mini extinguisher, mini fire extinguishers are manufactured from quality-tested components and are appreciated worldwide. We also meet customized requirement for our clients benefit and offer our range at industry leading prices. Environmentally-Friendly mini fire extinguisher without safety-pin with environmentally-friendly agent kept in the specially manufactured pouch has no risk of burst or explosion in high temperature. Continuous Durability It Can be used and stored permanently as long as the agent remains. Economical No need to refill or recharge the agent. Easy to use Remove the cap 2-3M away and push the button. Easy to use for kids, elderly and Females. Amazing Power Specially strong Against deep-fat fryer's fire and wood fire. Useful at outdoor. It can be spouted at 360, any angle. No harms caused by the agent after extinguishing. Useful over a temperature range of(-) 20C to 80C. Looking for Mini Extinguisher ?